1 of 2 While cooked risotto is still warm, in large bowl, combine risotto, beans, cilantro, scallions, cumin, cayenne and cheese blend. 2 of 2 Coat 13 x 9 x 2-inch glass baking dish with cooking spray. Spread risotto mixture in even layer, about 1 inch thick, over bottom of dish. Cover with plastic wrap; refrigerate overnight or up to 2 days. 1 of 4 In a medium-size bowl, stir together yogurt, cilantro, lime rind and juice, garlic, salt and pepper. Cover and refrigerate 30 minutes. 2 of 4 Heat oven to 450 degrees F. Coat two 15 x 11-inch baking pans with nonstick cooking spray. 3 of 4 Remove risotto from refrigerator. Using 2-1/2-inch biscuit cutter, cut out 15 cakes. Mold scraps to form 3 additional cakes. Place 9 cakes on each prepared pan. 4 of 4 Bake the risotto cakes in 450 degree F oven for 20 minutes or until slightly browned and crispy. 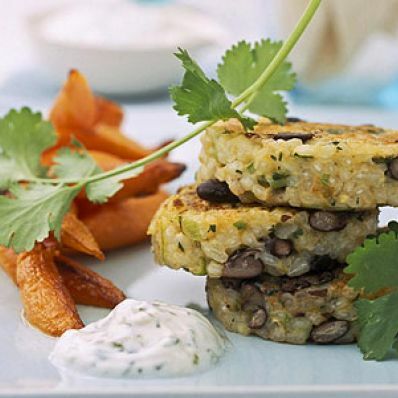 Serve risotto cakes with roasted carrots, warm flour tortillas and Yogurt-Cilantro Sauce on the side. Makes 6 servings. Per Serving: 5 g fiber, 1241 mg sodium, 11 g pro., 340 kcal cal., 9 g Fat, total, 51 g carb., 3 g sat. fat, 15 mg chol.